LEWISTON, Maine (AP) — Richard Rodrigue stood in the back of a banquet hall, watching his blond-haired, blue-eyed daughter mingle among her high school classmates. These teenagers speak dozens of languages, and hail from a dozen African nations. Rodrigue believes the refugees resuscitated his town — plugging the population drain that had threatened to cripple it, opening shops and restaurants in boarded-up storefronts. But he also agrees with Donald Trump that there should be no more of them, at least not now. America is struggling, he says, and needs to take care of its own before it takes care of anyone else. His working-class community, built along the banks of the Androscoggin River in the whitest state in America, is a place that some point to as proof that refugee integration can work. And yet for the first time in 30 years, voters in Androscoggin County chose a Republican for president, endorsing Trump’s nativist zeal against the very sort of immigrants who share their streets and their schools. Rodrigue knows he was born on the winning end of the American dream. His grandfather fled poverty in Quebec and moved to Maine to toil his whole life in the textile mills. He never learned English, faced hate and discrimination. Two generations later, Rodrigue owns a successful security company, lives in a tidy house in a quiet neighborhood and makes plans to send his daughter to college. Immigration worked for him. But it feels different today, as the county of 107,000 people tries to find its footing. The sprawling brick mills that line the river sit mostly shuttered. A quarter of children grow up poor. Taxpayers pick up the welfare tab. So Trump’s supporters here tie their embrace of his immigration clampdown to their economic anxieties, and their belief that the newcomers are taking more than they have earned. “There’s got to be a point in time when you have to say, ‘Whoa, let’s get the working people back up. Let’s bring the money in.’ But they keep coming, keep coming,” Rodrigue said. His community has been an experiment in immigration and all that comes with it — friendships, fear, triumphs, setbacks — and he knows that Trump’s presidency marks another chapter in that struggle for the American soul. No one invited the Somali refugees to Lewiston. They fled bullets and warlords to eventually be chosen for resettlement in big American cities, where they were unnerved by the crime and drugs and noise. In early 2001, a few refugee families struggling to afford housing in Portland ventured 30 miles north and found a city in retreat. Empty downtown stores were ringed by sagging apartment buildings no longer needed to house workers because so few workers remained. The refugees saw possibility in Lewiston’s decay. Word spread quickly, and friends and families followed. The town morphed in a matter of months into a laboratory for what happens when culture suddenly shifts. Maine’s population is 94 percent white, and its citizens were abruptly confronted with hundreds of black Muslims, traumatized by war and barely able to speak English. Ardo Mohamed came to Lewiston in 2001. She fled Mogadishu in the 1990s, when militiamen burst into the home she shared with her parents and nine siblings, and started shooting. She watched her father die, as the rest of the family escaped into the woods. They wound up in overcrowded refugee camps, separated for years, then finally Atlanta, then Lewiston. Now she fries sambusas with her sister at a shop she owns downtown. When the refugees began arriving, Tabitha Beauchesne was a student at Lewiston High School. Her new classmates were poor, but Beauchesne was poor, too. She grew up in a struggling family in housing projects downtown. It felt to her then, and it still feels to her now, that the refugees got more help than her family. “They just seemed to take over,” she said. She doesn’t consider herself racist, though acknowledges that race and religion likely play a role in her sense that the refugees overwhelmed her community. The African Muslims, many of whom wear hijabs, stand out far more than her French-Canadian ancestors did when they arrived generations ago, she said. That perception — one of being inundated by a culture so different from her own — ingrained in her a sense of injustice so deep it persists to this day. She’s now a stay-at-home mother of two, and she left Lewiston to move to another school district in the county because she believes the refugee students monopolize teachers’ attention. Once a Barack Obama supporter, Beauchesne turned to Trump — and she cheers his efforts to curb the flow of refugees into the United States. She wants Trump to design a tax system that funnels less of her money to aiding those from other countries. Taxpayers do help refugee families. 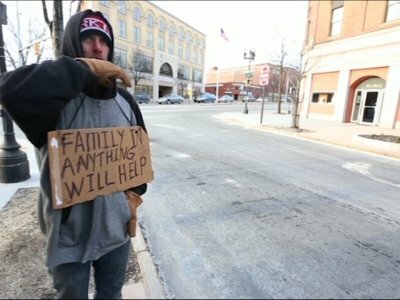 Maine offers a welfare program called General Assistance, a combination of state and city funds, which provides impoverished people with vouchers for rent, utilities and food. In 2002, at the beginning of the immigrant influx, the city handed out about $343,000 in General Assistance funds, split almost evenly between native-born Mainers and refugees, according to city records. But rumors, largely unfounded, spread that the refugees were given free cars and apartments. Locals began calling City Hall to demand answers. The letter plunged Lewiston overnight into the global political cauldron. A white-supremacist group from out of state planned a rally against the Somali “invasion.” Just a few people showed up. But across town 4,000 gathered in a gymnasium to support the Somalis and try to combat the reputation of Lewiston as a racist, xenophobic city that was rocketing around the world. And in that moment, the tide seemed to turn, deputy city administrator Phil Nadeau said. Even more immigrants came. Somali refugees gave way to those seeking asylum, from Angola, Burundi, Rwanda, a dozen nations in all. The immigrant population exploded from a handful of families to more than 7,000 people today, according to a tally by the Immigrant Resource Center of Maine. But the anxieties of old rarely seemed to resurface. But around the edges of the city, in the suburbs and small towns that fill out the rest of Androscoggin County, many quietly stewed. It’s there that Trump’s “America First” message took root. Thirty miles up the highway, Joyce Badeau greets customers by name at the hardware store where she works. She lives just outside Livermore Falls, population 3,187 — 3,035 of whom are white. She has little occasion to interact with immigrants, but her political views have been shaped by the idea of them. Badeau voted for Obama but backs Trump now, and points to his promise to rein in immigration as one reason why. She has watched the paper mills close and her neighbors lose good-paying jobs. But Badeau isn’t naive; she doesn’t believe Trump can make the mills roar back to life. That was a bygone era, replaced by email and iPhones. And his arrogance grates on her. But she hopes one day to turn on the news and not hear about crime and homelessness and terrorism — and she worries that someone who wants to hurt Americans might slip through porous borders. Trump promised to fix it all. If he can’t, she’s not sure what more America can offer immigrants. “Because they’re leaving one country of problems and coming into another country of problems,” she said. David Lovewell used to work at a paper mill just outside of Livermore Falls that has shed hundreds of jobs. Now he runs a logging company with his sons, but he sees a dim future for them. A few months ago, business got so bad he laid off eight employees and fell behind on his $5,500 monthly payments on the machines he uses to cut down trees. He looked down at his sneakers, bought for $25 at Wal-Mart. There used to be two shoe factories nearby. He wants Trump to stop his town’s slow slip toward irrelevancy. Lovewell doesn’t like to talk about immigration. He sighs and rubs his head, afraid to seem racist or indifferent to pain and poverty around the world. He went on a cruise to Belize with his wife several years ago, when he still worked at the mill and could afford a vacation. He stopped to buy a carving from an old man whose hands were so worn from years of whittling they looked like leather. He remembers those hands still, and the man’s dirt-floor shack with no doors and his skinny, starving dog and the kids riding around on broken bicycles. So he’s looking to Trump to strike a better balance — to build an economy where his sons don’t have to battle to barely get by, and only after that design an immigration system that keeps America’s promise of open arms. Politicians have seized on the discontent. Last August, candidate Trump stood on a stage in Portland and singled out the Somali community as causing a crime wave. The Lewiston police chief quickly refuted the charge — crime has decreased dramatically since the refugees arrived — but it stuck in the minds of many. Maine’s Republican governor, Paul LePage, has called asylum-seekers “the biggest problem in our state,” and suggested they bring danger and disease. And in Androscoggin County, Republican leaders hammer the issue of refugee resettlement on their Facebook page, with post after post about the injustice they see in taxpayers helping them with assistance. They’ve dubbed it “the refugee racket,” and complain that the school system is forced to accommodate 34 languages. Lewiston School Superintendent Bill Webster acknowledges that does cost money. But he has a statistic he likes to share with the critics. Historically, Lewiston has had some of the lowest high school graduation rates in the state. Now, immigrant children are doing better than native-born kids. Some were illiterate in their native language when they set out to learn English. Yet an average of 78.3 percent of immigrant students graduate high school within five years, compared to an average of 73.3 percent of native students. Fifteen years ago, the school district had an enrollment of 4,500 students and falling — a sign of a city on its knees, Webster said. Today, there are 5,400 students, more than one-quarter of them immigrants, and the number is going up. And now the immigrant children who grew up here are going off to college to get degrees, as teachers, doctors, engineers. Maine’s immigrants from sub-Saharan Africa made $136.6 million in income in 2014, and paid $40 million in taxes, according to one report from a bipartisan think tank. But they largely work in invisible jobs, said Catherine Besteman, a professor of anthropology at Maine’s Colby College. They take out trash at hotels, do the laundry at the hospital. People don’t see them working, she said, so when they see them driving a car, or shopping for groceries, it becomes easy to assume they got it for free. That leaves some here still feeling that the immigrants take more than they deserve. Tabitha Beauchesne pulled a bag of bargain-brand cereal out of her kitchen cabinet to demonstrate that point. At the grocery store, she said, she sees immigrant mothers with carts piled high with name-brand food. So Mohamed Ibrahim now knocks on doors. He wants his neighbors to know him, to know that he is normal. Trump’s election here taught him he has a lot more work to do. Ibrahim came in 2012 from Djibouti, where he risked imprisonment for opposing his government. He is one of the thousands who have flooded into Lewiston in recent years because they are seeking asylum from oppression. With them came a spike in the amount of taxpayer assistance going to immigrants. Asylum-seekers, unlike resettled refugees, are barred from getting work permits for at least six months and many, like Ibrahim, must rely on government assistance to get by when they first arrive. The amount paid to immigrants jumped recently to nearly a half-million dollars. And there seems to be more tension in town since Trump took office. One woman reported she was nearly run down by a screaming driver; another said someone jerked her hijab and told her to go back where she came from. Ardo Mohamed, the Somali who cooks sambusas with her sister, is an American citizen now. Her children were born in the United States. But they worry the government will come to send her away. Ibrahim does not blame his neighbors for supporting Trump, because he’s seen the pull of populism before. When his friends complain about the policies on immigration, he reminds them of the day, more than a decade ago, that the interior minister of their country ordered all illegal immigrants to leave or face mass arrest. He asks them how they felt, and they respond: patriotic - like their government was looking out for them. Ibrahim has his own hopes for the president. He hopes Trump will build an immigration system that gives people confidence that those coming are good and hardworking - so that, one day, people like him will be called Americans, not refugees. But he worries it will come at a cost. In 50 years, he thinks, the descendants of his fellow African immigrants will be suspicious of whoever comes next. “That’s how it’s been through history. The Irish were discriminated against, and then they discriminated against the French. The French were discriminated against, now they discriminate against us, at the bottom of the ladder,” he said, laughing uncomfortably. AP data journalist Angeliki Kastanis contributed to this report. Read more of AP’s coverage of Americans looking to Trump for change.